How's that for a bizarre headline? But you can read the article for yourself--the one where Columbia law professor Christina Duffy Burnett says she's "pulling for" statehood for the tiny island of Palmyra. The US got Palmyra (and 100+ similar islands) in the guano boom... when bird poop was a prized fertilizer. Congress passed a law saying that any unclaimed island with lots of guano could be claimed for the U.S. The learned Prof. Christina Duffy Burnett says that US law creates a legal slippery slope that--in theory--should mean statehood for each guano island. 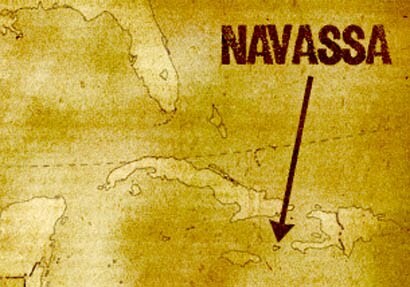 Before professor Burnett, I was the only person goofy enough to propose statehood for a guano island (Navassa, in Lost States). Now there's two of us--and one of us actually knows what she's talking about (hint, it's Prof. Burnett.). Before I get carried away, I should mention that Prof. Christina Duffy Burnett was making a point about the law, not the likelihood of statehood for some abandoned rock in the Atlantic. She kiddingly suggested herself as senator of the new state. At least I think she was kidding. Read the whole thing here. I'm sure that Cesidio Tallini is an excellent designer... and I'm certainly not against Long Island statehood. 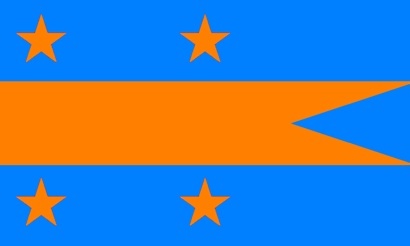 But the color combination he chose for the state flag of Long Island... is kinda giving me a headache. I thought it was just me, but some specialists in color theory at Penn State agree that orange-on-blue is a no-no. But don't give up Cesidio... just tweak the colors a bit! Read more here from the Long Island statehood site. And look away before you get a headache! Mother Jones just did a piece on Yooper statehood. For you non-locals, a Yooper us someone who lives in the U.P. (Upper Peninsula) of Michigan. So U. P. = Yoop.... get it? Anyway, statehood for the Upper Peninsula (including portions of northern Wisconsin) has been discussed for many years. Occasionally, the talk gets more serious--like the 1970s proposal of a new state of Superior (see above). The Mother Jones writer makes the point that it's easy to see the cultural difference between lower Michigan and the U.P. by counting the number of public rest areas. The lower part of Michigan has lots of 'em. 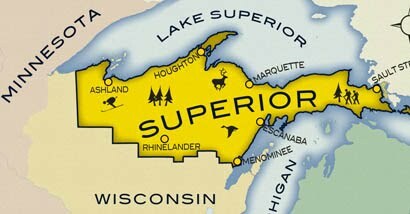 The U.P.??.... well, they just use a tree. Read more here. Of course, I'll sign your book--and I'll even sign that copy you're buying for Uncle Fred for Christmas. Is Alaska leaving the U.S.?? Is Alaska leaving the United States? Newsweek magazine tosses around the idea this week. It's not as bizarre as you might think. There is a growing independence party in Alaska; the state has lots of natural resources; and it's only been a U.S. state for 51 years. Heck it wasn't that long along that Alaska was part of Russia. 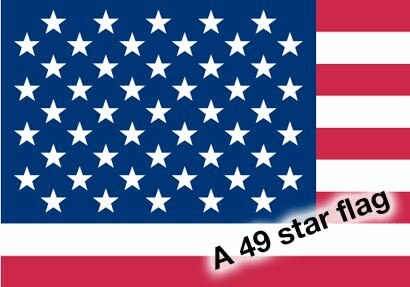 Of course, de-statehood would be a boon to flag makers--we'd all have to go back to a 49 star flag (above). 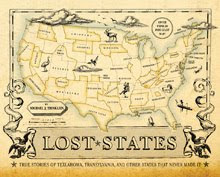 I thought I covered every possible 51st state proposal in Lost States, but I did miss one or two—like North Virginia. Since the 1970s, the cosmopolitan folk of the northern Virginia area near DC have been kicking around the idea of separating themselves from the downstate folks. The common joke is that if you take Northern Virginia out of Virginia, you get Arkansas. Ouch. It's true that Virginia is big; the twelfth biggest state. And it stretches farther west than Detroit. 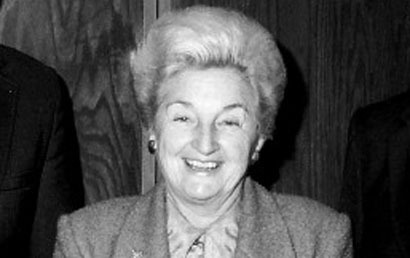 Some very important people have suggested splitting the state, including supervisor Martha Pennino (pictured above). The idea hasn't gotten too far... yet. 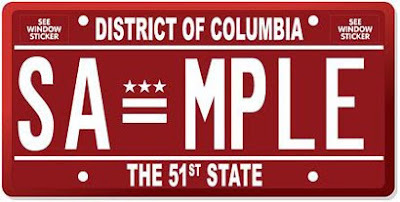 But if you meld it with the DC statehood proposal, it makes both ideas more feasible. Read an extensive article about the differences between north and south Virginia here. And for more about the idea to combine Northern Virginia with DC to make the 51st state, read this. 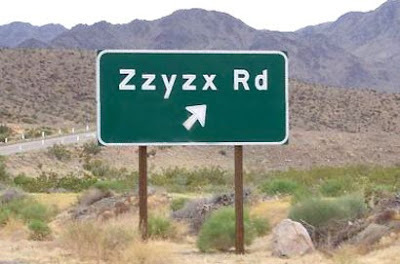 What place name is dead last in the geographic dictionary? It's Zzyzx, on the Interstate between LA and Vegas. It was a resort, of sorts, created out of nothing by Curtis Howe Springer. Springer made enormous sums of money by selling "medicine" that was nothing more than fruit juice. Eventually, the FDA caught up with him and the whole enterprise went belly-up. But the remains of his resort still exist... read more about it here.